Welcome to day eight! I have put off working on this post till the very last minute! I knew it was going to be a tough one for me! So...deep breath - here we go! 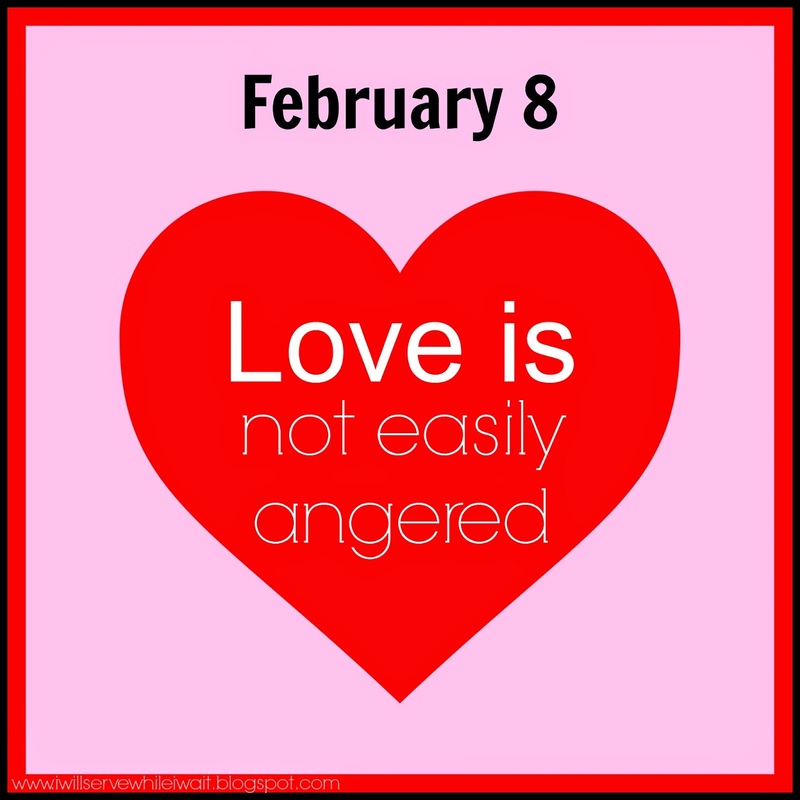 Love is not easily angered. Other translations tell us love doesn't fly off the handle (The Message), love is not irritable (Good News Translation), or love isn't easily upset (The Voice). Once again - I'm getting the message loud and clear. I'm terrible about flying off the handle. Ugh! I can get upset for a number of reasons but one of the things that sets me off the most is when I've been hurt. Usually hot tears puddle in my eyes (which makes me mad! ), and then I'll call a friend and say, "can you believe...", and finally I will just avoid the person that hurt me completely. Better to avoid a confrontation than say something you'll regret, right?! Um...no - better to not get angry in the beginning. Then the Lord reached out his hand and touched my mouth and said to me, “I have put my words in your mouth. I love so many of those versus for so many reasons. Wonderful reminders to overlook insults, use gentle answers, and remember that the Lord is with me! We can do this - with His help! Come back tomorrow for love keeps no records of wrongs - how many more days till the protects, trusts, hopes, perseveres - you know, the good stuff! :) Just kidding! There's some great stuff to learn tomorrow. Hope to see you then! Quick to anger is something I have struggled with plus holding a grudge, until recent years. I have realized me holding onto anger is only hurting me. I have leanered, when the other person hurt me, they didn't care so they don't care I am still angry. Why give them the power over me? The older I get, the easier I find myself getting annoyed with things. Luckily for my family it's not with them! It's more when I am in public...bad drivers, the person blocking the grocery aisle I need down, the unhappy cashier, I could go on and on unfortunately. I don't know why I let myself get upset with such silly things! It must be an age thing! :) Just no time for inefficiency, right?! :) Things to do - people to see! All joking aside, I know exactly what you are talking about. But, I think the things that annoy us go back to making sure our decisions (usually selfishly motivated) aren't affecting others. Bad drivers, the person blocking the grocery aisle, unhappy cashiers - examples of people putting themselves first... Just something to think about. Thanks for reading!